Working alongside Will Regan, David Rabin, Jeffrey Jah, as well as, Richie Akiva & Scot Sartiano (Butter NYC, 1OAK NYC, The Darby NYC), I had the opportunity to work directly with IMG Fashion to coordinate the event planning, layout and execution of the Mercedes-Benz Fashion Week Closing Party hosting by New York Times and Vevant. 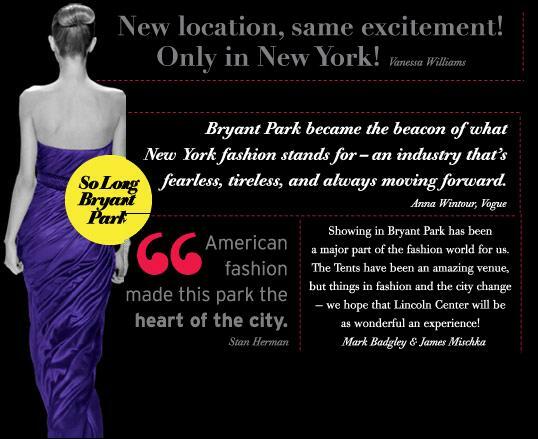 The event was held to commemorate 17 years and 31 seasons in Bryant Park, this was the farewell event before Fashion Week moved its hub to Lincoln Center. The event was over 5 hours long and was attending by several thousand of New York’s most influential tastemakers. The event coordination involved overseeing the floor plan development & final layout, guest seating design to ensure the best flow of traffic, bar program development including sponsored product needs & supervision, and implementing systems to oversee guest list, door procedure, staff and service protocol. To see more photos of this event, please click HERE.